Unfortunately, I could show you far too many photos from "forgotten cemeteries," the topic for the latest Graveyard Rabbit Carnival. To be fair, most of the cemeteries I come across can actually more accurately be described as containing forgotten individuals. 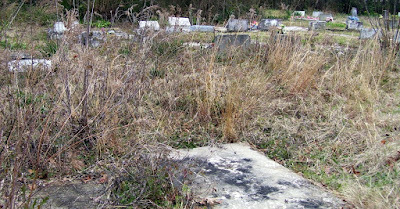 This photo shows what the area surrounding a cemetery in my part of the country often looks like. It is more common to find a cemetery that was once on family land or attached to a church rather than a large perpetual care cemetery. Especially if you find yourself traveling in rural areas away from any sizable town. These cemeteries are not always abandoned, though. They are sometimes still in use. It's just that not every burial site within the cemetery is visited or taken care of. This is New Bethel Cemetery. It is located near Emerich in Dooly County, Georgia. Until yesterday, I had never heard of Emerich. It is on the map, however. Many parts of this cemetery are quite overgrown. There are many graves, however, that are obviously well tended. Those gravestones are freshly painted (a practice I wish people would stop doing, as it damages the stone and makes the inscription illegible when the paint begins to fade, dry up, and chip) and have freshly placed floral offerings. The photo above shows the differences within the cemetery. 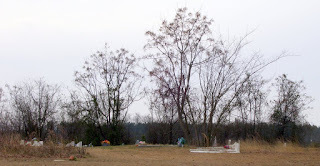 The graves in the foreground are somewhat overgrown (and this is winter, imagine how it will look in the summer), yet there is a grave in the background that has pink flowers making a border around the entire burial site. You may wish to click on the picture to see it full size. 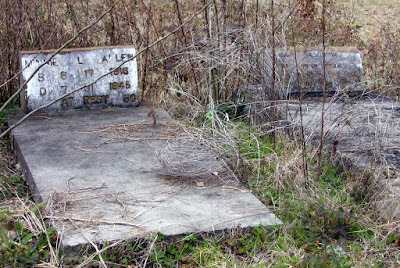 These are the graves of Minnie L. Allen (1916-1945) and Sam Adkinson (1884-1958). If I were to return in the summer, I bet I would not see the headstones at all. When I first pulled into the cemetery, I thought it was completely fenced in, as I entered through a gate. There is someone living next door, and I heard their dogs barking when I got out of my car. I did not think twice because I thought I was inside a fence. Not true, though! The fence did not even go half way around the cemetery. I noticed this when these two darlings came running up to me wanting to play. Thankfully, they were nice pups. It appears they are the only caretakers for this cemetery as a whole. They are probably doing the best they can, but need some help. You make a good point.In old,overgrown cemetery's it is worth a revisit in the winter to see what can be well hidden in summer.I can think of a couple I need to "re-see"!Thanks! I recently found the cemetery where my grandfather and grandmother were laid to rest. It is a small cemetery on "private property" which was once the property of the people whom my grandparents worked for as share-croppers. I had to find the owner of the property, (about 100 acres on whch they raised cows for sell to slaughter). The owner then had to lead us to the property and then unlock the gate, and lead us across the land to the cemetery. 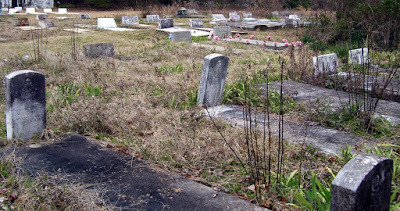 The cemetery was totally abandoned and forgotten. 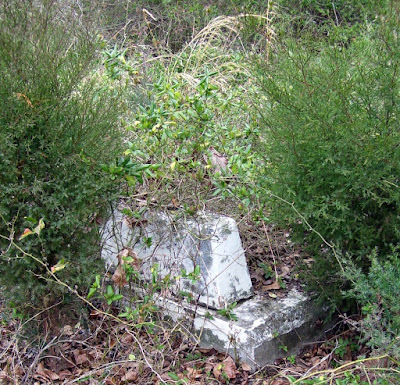 Although the entire pasture of land was clear and the grass was cut, the cemetery was the only place on the entire land which the owners had allowed to become overgrown with trees, and bushes growing up through the graves and headstones. They even allowed the cows to walk freely through the cemetery, leaving "cow chips" all over the graves and trample over headstones and graves. Entering the cemetery was like entering into a small forest in the middle of a pasture. Many graves were sunken in; headstones were missing; and some markers were broken and displaced. We had to search for my grandfather's marker. Thank God his was still in tact and not over-grown, broken or displaced. The cows had also steered clear of it also. I was in tears at finding my grandfather. He was placed there in 1960. My grandmother preceded him and was placed there in 1934. We could not find her. I was told that her marker may have been made of wood (as many were then)and the wood may have deteriorated by now. I first thought to remove my grandfather to a more respectful cemetery, with other family members at our family church. But now that I can't find my grandmother, I don't want to relocate him and leave her there alone. So, now I am contemplating propositioning the land owner to sell me the land where the cemetery is located, and then fencing it off and having the land cleared, (not in that order). I haven't priced it yet and don't know if he will even consider selling it. If he did, I would also need him to allow me an easement of land to build a road to the cemetery, so people could get to it without having to find their way to his house and ask him to lead them to the property, and unlock the gate for them to enter, and then lead them to the cemetery. (The owner seems veeeery protective of his property, which has at least four stocked lakes on it. He even stopped to shoo someone away from fishing in one lake as we were leaving the property.